Caution. Not. Enough. Information. Yet. Couldn't disagree with you more on this one, Hocus Locus. Building 7 was controlled demolition -period. First responders were even told that the building was going to be "brought Down" on purpose. People heard what sounded like bombs going off seconds before it fell. Some witnesses have even come forward to say that the official damage report to Building 7's South side is BS. Consider that Seven being an imminent collapse threat, mere discussion at Ground Zero regarding how to help it along to mitigate that threat quickly so rescue work could resume on the pile (responders pulled off at ~3:30pm) could continue, is rational and plausible. And would make excellent fodder for misreporting and subsequent Truth Movement mismanagement. It seems to be a road less travelled -- my intuitive track that hidden in the Oral Testimonies (among noise) are some pertinent pieces of data -- and the gut feeling that the psyop movement has been steered away from scrutiny of those first responder interviews. I also feel that when the final torch is carried regarding the towers' (NOT Seven) fate, it will be a member of the NY Fire Department that wields it. And someone knows it -- and they have taken direct action to attack credibility of the group: in ways indirect, insidious ways, that seek to tiptoe around their 'hero' status. In ways that are documentable and there will be a trail to follow, backwards. The Gap Jeans smear for example. Oral Testimonies are seldom mentioned except the snippets of directed quoting out of context of explosions heard which is to be expected on a day where everything's on fire. You have collapse overpressure waves carrying and depositing small smoudering bits of paper for blocks in every direction, which can easily explain other shocking trivia like vehicles' gas tanks detonating, when the bits become lodged near the air vent behind the gas cap. You have military jets making sonic booms. So 'boom' isn't enough. It's got to come down to people, places, situations and things. Contrast this treatment with the excellent parsing job of the Columbine witnesses' statements. Responder interviews simply have not had this level of corroborative collation. The task is immense! But I'm on it; one fruit being the suspicious blowout of elevator doors on 22FLNT, as if taking out control systems there was an in-building objective. And the topic was a certain X-files Ruppert-esque allegation of a PTECH Promis-type computer infiltration. Which she investigated and presented in a purely conspiratorial (so and so 'associated with' so and so) way. When telling where she had gotten the information, in one moment her voice seemed about to say 'retired' (EDIT: or 'fff-former', been awhile since I listened) when refering to the source, then paused (slightly) and dropped the 'retired' (so as not to infringe on credibility?). Worth listening for, pains me to point such things out another human but the subject is of grave importance. Arriving me at the conclusion, 'spoon-fed' or even 'daily bread'. they told us we had to move from that triage site up to Pace University a little further away because Building 7 was going to come down or being brought down. Why mention both possibilities? Unless one was not sure what one heard, or one knows one actually heard 'come down', and one wishes to ply the audience with the other as conspiratorial currency. Inclusion of both yields a result neither convincing nor (with due respect to the speaker) certain. Yes. Agreed. But I'm. pedalling. As fast. As I can. Whew! Churchill's Commentary on Man: Man will occasionally stumble over the truth, but most of the time he will pick himself up and continue on. Another possibility here is that they were told both...that it was not clear to her which they meant. Just a nit but maybe an important one. It's kind of along the lines of "it's going to blow up" or "it blew up" versus "it's coming down" or "it came down." Why have we heard so much of both? in the arm for the 9/11 Truth movement. battle to expose the grisly truth of September 11th. clairvoyance" to their list of gripes against the mainstream version. reveal the source of it's misinformation. that WTC7 has collapsed, while it stands proudly in the background. But the real joke is on the truth movement. there eventually leads to gaining a clear majority. 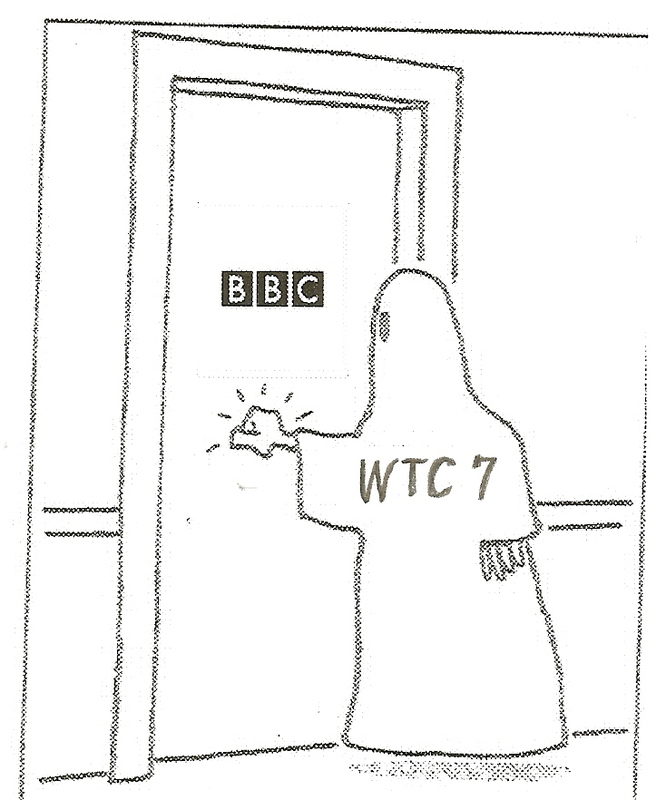 being played by the engineers of the BBC-WTC7 'controversy'. another issue entirely, by the way. big deal about the BBC error can be portrayed as the raving of fanatics. luminaries in the 9/11 truth movement to be used by the mainstream. for a couple of things used to hook the interest of the 9/11 truthers. that there really was something of advantage to them being suppressed. attacking the 9/11 Truth Movement. the memories of the bereaved while propagating wild allegations. right in their recent demonization based on carefully selected 'facts'. of middle ground opinion over the true nature of the 9/11 attacks. and spokespersons for the 9/11 truth movement. to be used against the people they nominally represent. The only arena where this battle for minds will be won is the internet. their suspicions would soon harden into convictions. that mere bitching about the accuracy of a staged BBC error. the line on the crumbling edifice of the official account of 9/11. continue to play fools to the gallery of public opinion. That makes sense and explains a lot of the anomalies with the story. 1. How is it possible that this story hasn't been raised earlier, years earlier? 2. Why doesn't she ever look behind her to notice that she's got the WTC7 behind her the whole time? 3. Why can't they find this little ditty today? THERE IS NO DOWNSIDE TO THIS STORY COMING OUT. Millions of people are now hearing about Building 7 for the first time thanks to it, and to 9/11 researchers who are working hard to expose the 9/11 criminals. This isn't for everyone here so ignore this and move on if you haven't been suckered today. For those that aren't so sure... well we never have all the facts about anything. We can only hope to assemble enough to prove beyond reasonable doubt. The wonderful thing about human life is that we all make mistakes that are correctable. Its human nature and totally acceptable to be imperfect and flawed. But as beings capable of analytical and rational thought, we may learn from our mistakes should we expend a little effort to reflect on our experiences. Other beings are not so gifted with this choice. And learning is a choice, nothing more. But even in the animal world a creature may adjust to its actions, hangouts and habit. Even a dog, who cannot assemble any complicated analytical thoughts, may cease to chase cars, after being run over by them a few times. A smart dog avoids cars entirely, while other dogs may chase until hit by a car once, then learn the permanent painful lesson. The bottom line is: The fake medias on the Internet produce lies. The mainstream medias produce the same lies, co-existing and bolstering each others mandates. They are symbiotic parasites, we are all convinced of that. We have analyzed volumes of proof to show that they exist only to twist lies to dissipate critical questioning and analytical thought. How can we now believe that the fake media is suddenly and uncharacteristically, against their mandate, disseminating a truth? Why is it that some of us are still chasing the same cars down on the same corners? The next level awaits those crippled and battered chasers. It is a simple human choice. Show off your battle scars and show us where you got them. Perhaps we can eliminate those dangerous corners and hold responsible their liars out front directing the traffic. These are criminals after all and justice will help to heal the wounds. We have to look about what is the content of this "new" event. BBC knew in advance? If it's true, what we can prove beyond this? That BBC is infiltrated by agent provocateur or something. Maybe, but it's not the way to prove it like it seems to be done now because the real "agent provocateur" knows the skepticism felt by a part of the public toward the mainstream media and want to guide the popular anger to it. I'm not defending BBC in specific but freedom in general because if we go on with this reasoning, in the finish we'll find ourselves without any professionnal media. Only a voice which says us what we desire to hear. You think we should be reassured by you being in at the genesis of this story. And yeah, I'm sure the BBC-error tale has a well-laid "back-story". I would expect no less from the agency. trying to implicate a news reporter and the BBC in the collapse? You sound really confused with fragmented thoughts. What you just said doesn't make any sense at all. You're most probably correct, Fintan, but there is another possible explanation. Perhaps someone, having seen or been incensed by the BBC hit-piece, was looking for footage and happened to notice this.